The athletic skill of deceleration is one of the most often overlooked and underappreciated skills in sport training. Yet, it is also one of the most vital aspects of a well-designed athletic performance program. The subject of deceleration in sport is extensive, and relates to both upper-body and lower-body performance. In this article, we will take a look at deceleration as it relates to the lower-body and injury prevention. As the adage in sport goes, “speed kills.” The quicker, faster athlete generally is considered the superior athlete in most sports. But it’s by focusing on the flip-side of the speed coin – Deceleration – that a trainer or coach can make the athlete a more effective one and help keep them safe. Speed, as it relates to sport, can be looked at in two ways – Raw Speed, and Effective Speed. Most trainers and coaches are very familiar with the parameters of Raw Speed through the combine-type testing of the 40-yard dash. This type of straight-ahead speed may be effective as a testing tool, or in a sport like track, serves as a true measure of athletic performance. But, in sports that require quick stops and starts, cutting and other change of direction, raw speed has little relationship to actual athletic performance. Effective Speed – which is more closely aligned to the shuttle run combine test – describes the type of functional speed necessary to most sports. Change of direction and deceleration are key components of such sports as tennis, basketball and soccer. Deceleration is an attribute that allows the athlete to slow-down or stop while performing an athletic skill such as converting a basket or hitting a winning volley (Hewitt, et al., 2011). For example, a basketball player sprinting down the court on a breakaway must have the ability to decelerate and safely convert that horizontal speed to a vertical lift or jump. If the athlete is unable to effectively bring his/her body and momentum under control while performing the athletic skill, he/she could miss the shot, or worse, get injured. Deceleration requires an eccentric contraction of the muscles while absorbing forces created by the body’s acceleration. So, let’s take a look at some key training components effecting the athlete’s ability to decelerate as it relates to effective speed and injury prevention. The COG is considered to be located somewhere around the athlete’s belly button. Where it goes, determines where the athlete’s momentum goes. The athlete’s BOS is where the athlete’s body contacts the ground, or in other words, the feet when the athlete is standing. In general terms, when the COG moves forward and ahead of the BOS, the athlete will accelerate in that direction. And, where the athlete’s COG is behind the BOS, the athlete will slow-down or even come to a stop. So, in acceleration training, having the COG moving forward in the direction of the intended action will help the athlete speed-up. An analogy that I like to use is watching someone walking uphill. In order to accelerate their body and to keep moving forward, instead of falling backwards downhill, the person must lean forward, causing their COG to move ahead of the BOS to help propel them uphill. Acceleration also requires the production of large amounts of force, provided primarily through the concentric contraction of the lower body musculature. Conversely, to decelerate or slow-down when walking downhill, the person “brakes” by bringing their COG behind their BOS, or in other words have a slight backwards lean in order to keep from tumbling downhill out of control. This braking or deceleration requires a reduction in the forces created by the acceleration downhill and is produced by a lengthening, or eccentric contraction of the lower body muscles. Authors reporting on injury prevention strategies cite to research suggesting that there is a strong relationship between eccentric muscle reactions --- deceleration --- and injury (LaStayo, et al., 2003; Jeronimo & Pelot, n.d.). While this uphill-downhill example is illustrative of the body positioning necessary to effectively accelerate or decelerate, in a sport that requires multiple changes of direction, the athlete must be prepared to quickly reaccelerate to the next action after decelerating and performing their athletic skill. This ability to dissipate the forces of acceleration to slow-down or stop, affect an athletic skill, and then quickly reaccelerate is known as Reactive Strength. Reactive Strength incorporates the ability to quickly convert from the muscle lengthening or eccentric contraction necessary for deceleration, to the muscle shortening or concentric contraction necessary to reaccelerate. So, how would this relate to training and injury prevention? Because reactive strength involves the muscle’s ability to quickly convert from a lengthening or eccentric contraction, to a shortening or concentric contraction, plyometric training is essential for this type of strength building. Plyometric training recruits the Stretch-Shortening Cycle which trains the athlete to quickly recover from a deceleration to an acceleration, while at the same time developing power. Let’s take a look at tennis --- a sport requiring frequent multiple stops, starts and change of direction. The lower body of a tennis athlete must be prepared to make multiple decelerations laterally, forward and backwards during the course of a typical match. As this relates to sports performance, the athlete must not only have the ability to get to the tennis ball, but once there must effectuate a tennis stroke, oftentimes from an awkward body position. If the athlete is unable to slow-down or even stop to properly position for the shot, they may miss it, or even if they make it, may be in a poor position to recover for the next shot. As this relates to injury prevention, if the athlete is unable to properly control their COG or to dissipate and reproduce the forces involved in acceleration and deceleration, undue strain on their joints could result in injury (Kovacs, et al., 2008). 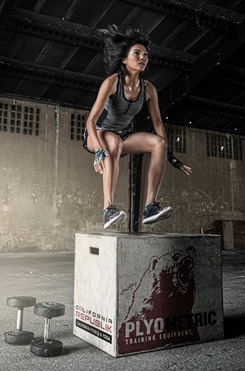 One of the best ways to help your athlete develop or improve their ability to decelerate effectively and therefore reduce their risk of injury is through plyometric training (Davies, et al., 2015). Since one of the goals of plyometric training is to improve the athlete’s ability to produce force or power, a necessary by-product of that training is learning to safely accept the forces created, which relates to injury prevention. The stretch-shortening cycle of plyometric training teaches your athlete to produce-absorb-redirect-and apply the forces necessary in a safe and efficient way. By varying the type of plyometric used, the conditions under which the athlete performs, and variables such as the timing of the stretch-shortening cycle, you can help better prepare the athlete to deal with the unpredictable patterns they will face on the field of play. While plyometric training is most often cited for its ability to improve your athlete’s power potential, it also serves the dual purpose of training their muscles to deal with powerful eccentric contractions in a way that helps improve their deceleration ability and ability to resist injury. LaStayo, P.C., Wolf, J.M., Lewek, M.D., Snyder-Mackler, L., Reich, T., & Lindstedt, S.L. (2003). Eccentric muscle contractions: Their contribution to injury , prevention, rehabilitation and sport. Journal of Orthopaedic & Sports Physical Therapy, 33(10), 557-571. Hewit, J., Cronin, J., Button, C., & Hume, P. (2011). Understanding deceleration in sport. Strength and Conditioning Journal, 33(1), 47-52. Kovacs, M.S., Roetert, P.E., & Ellenbecker, T.S. (2008). Efficient deceleration: The forgotten factor in tennis-specific training. Strength and Conditioning Journal, 30(6), 58-69. Davies, G., Riemann, B.L., & Manske, R. (2015). Current concepts of plyometric exercise. The International Journal of Sports Physical Therapy, 10(6), 760-786.